All matter is made up of tiny atoms which include a nucleus surrounded by a cloud of rapidly moving electrons. Hydrogen is the most common element in the Universe and also the simplest. It has only one electron. A "prefered" state for an atom is to have 2 electrons, so hydrogen tends to bond to other atoms in order to share electrons. A water molecule is made up of 2 hydrogen atoms and 1 oxygen atom. Because in this case the 3 atoms share the electrons more or less equally, the molecule is held together by what is called a covalent bond. 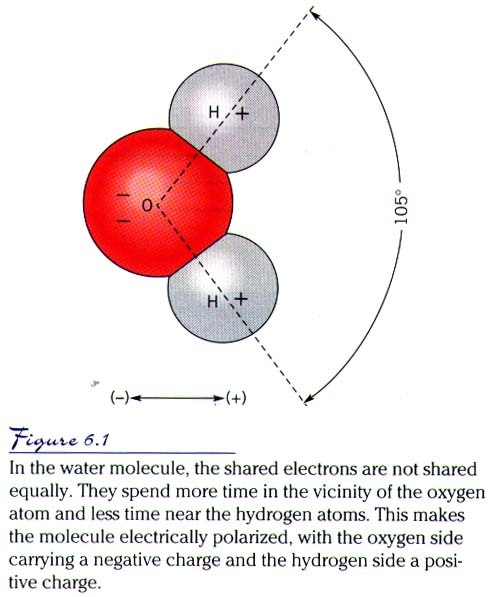 Note that I said more or less equally because in fact, the oxygen atom hangs on a little more tightly to the shared electrons (remember electrons have a negative charge) and so the oxygen side of the molecule is slightly negatively charged and the hydrogen side is slightly positively charged. This makes the water molecule polarized. This is important because it means that the charged ends of a water molecule are attracted to oppositely charged portions of whatever other molecule it encounters, water or otherwise. Therefore, water is sort of "sticky," and this gives it very unusual properties. We said everything is made up of atoms. Atoms and molecules constantly move around, even in matter which is solid. The more the atoms or molecules are moving around, the more energy the matter has. Temperature then measures the energy or the movement of the molecule. As something is heated, its molecules move around faster and so the energy and thus the temperature increases. On the Celsius temperature scale water boils at 100°C and freezes at 0°C. Specific Heat of a substance is defined as the amount of heat required to raise the temperature of 1 gram of the substance 1°C. The heat required to do this is a calorie. Now consider those sticky water molecules. Because theyre sticky, its hard to make them move. Thus it takes a lot of energy. 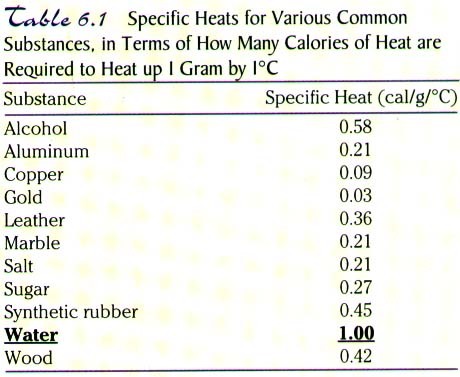 Water therefore has a much higher specific heat than all other common materials. Generally, heavier molecules, or those with higher atomic weights are more sluggish and slow moving at any given temperature and thus tend to have higher melting and boiling points. Water is an exception to this pattern because it is quite light and lively and yet has high boiling and melting points. This is again a consequence of its "stickiness." Consider ice melting. It takes a lot of energy to shake loose those sticky molecules. Likewise it is difficult to pull apart liquid water and make is evaporate as gas. This is a good thing. It that werent the case, there would be little liquid water on earth, no oceans, and wed have nothing to talk about here! Latent Heat of a substance is a little confusing, but also important in understanding how our oceans work. Again because it is "sticky," water has high latent heat. This is the amount of energy required to melt 1 gram of solid or evaporate 1 gram of liquid. Once you bring an ice cube to the melting point, you still have to add a lot of heat to actually melt it. This heat or energy is required to shake loose those frozen bonds. The heat thus takes ice at 0°C and makes it liquid at 0°C. Likewise, it takes a lot of energy to turn liquid water to gas. Consider that "watched pot!" It takes forever to boil! This is actually why you feel cool when you step out of the shower. Energy (heat) used to evaporate the water on you is leaving your skin and so reducing its temperature. This ability of water to hold energy will become important a bit later. Another key property of water is that the cooler, solid phase—ice—is less dense or lighter than the liquid phase. Ice floats. Water freezes over. This is a result of the crystalline structure of ice. 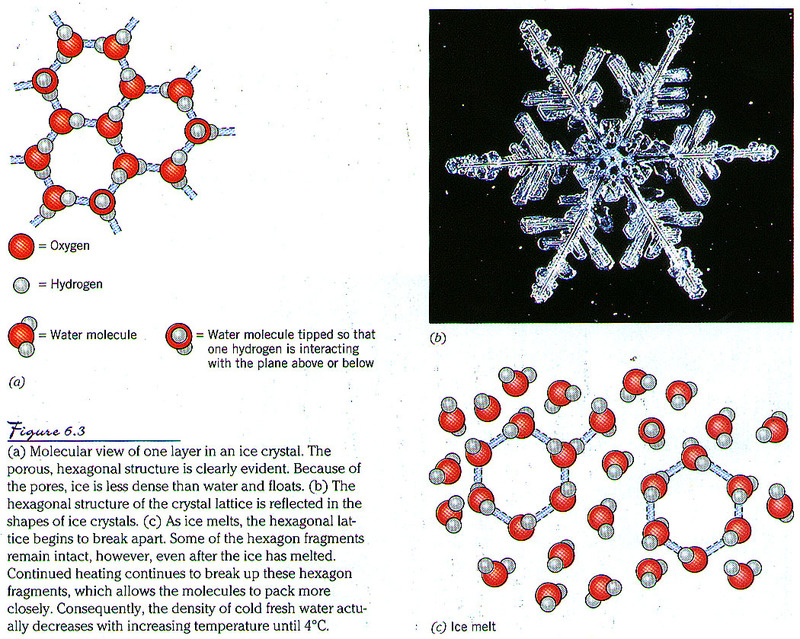 The molecules freeze together in a hexagonal (6-sided) structure (like a snowflake). This allows for air space in the structure and the air makes the ice light. 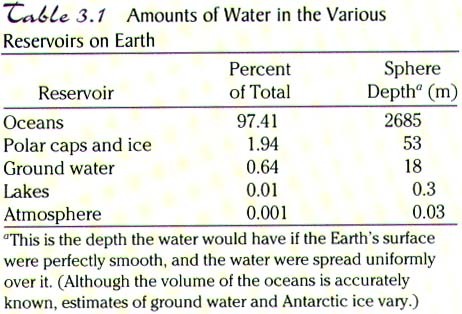 Consider what would happen if water was like everything else and when it froze it sank. What would happen to fish in ponds in the winter? How would the Arctic be different? Generally, the colder things are, the denser, but in the case of water, even after it melts there is a tendency of the molecules to cling together in fragments of the frozen crystalline structure. For this reason, pure water is most dense at 4°C. When you add salt though, it tends to interrupt the crystal formation and so saltwater is densest at 0°C. Remember that water molecules are polarized and so they easily "stick" to other mateials. This means it is one of natures best solvents. The water molecules stick to other molecules and pull them apart, or dissolve them. The only molecules it cant dissolve are those with extremely even charge distributions, i.e. those which are not at all polarized. Fortunately for us, most organic molecules, the stuff living things are made of, fall into this category. Thats why we dont melt in the rain like the Wicked Witch of the West. The most soluble materials tend to be ionic salts or materials that separate into ions with positive or negative charges when they dissolve. Sodium Chloride (NaCl) is one of these. It is the same thing as table salt, but you dont see crystals of table salt floating around in the ocean, do you? 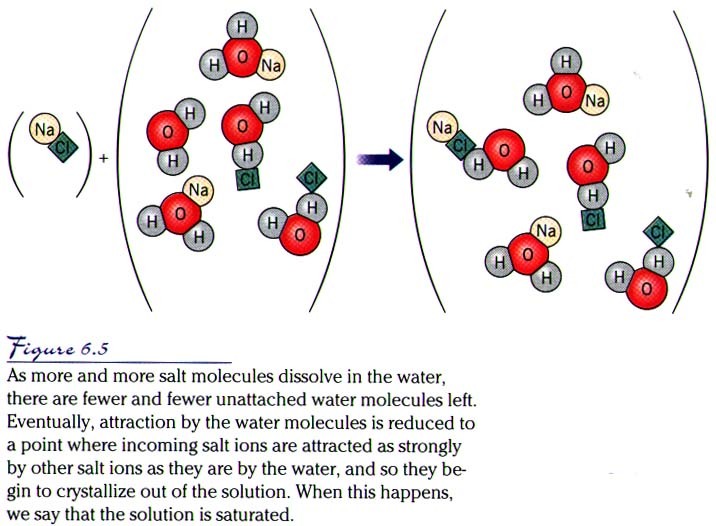 Instead, the Na + and Cl- exist as separate ions attached to water molecules. Once there is so much salt in water that there is as strong a pull salt ion to salt ion as there is water to salt ion, you cannot make the water any more salty and the solution is said to be saturated. (Note that the same thing can happen with dissolved gases in water). Youre familiar with this phenomenon if youve ever tried to sweeten up iced tea youve gotten in a restaurant up north. In Pennsylvania, you make your tea, cool it off, and add sugar. After youve added some sugar, no more will dissolve no matter how hard you stir. The sugar molecules pull on each other just as hard as the water is pulling on them and they stay sugar. The tea is saturated (and doesnt qualify as "sweet tea" to a southerner!). Since these positive and negative salt ions take up some of the positive and negative sides of the water molecules making it more difficult for them to bond and form into the hexagonal crystalline structure of ice. For this reason, salt water requires a lower temperature to freeze. Also, when water does freeze or evaporate, the salt is left behind. You know this because when you come home from the beach you are all salty, right? Since water is such a good solvent, of the 92 naturally occurring elements, more than 80 have been found in seawater and its probable that the rest are there, but in such trace (science talk for "small") amounts that we cant detect them. So how did they get there? Turns out that its mostly been erosion from rocks and soil over time. We know this because the relative abundances of the various salts in the ocean are similar to the abundances found on earth. The most common are sodium, calcium, magnesium, and potassium. This does not explain the high levels of chlorine, bromine, sulfur, nitrogen, carbon, and water itself, however, since these are not very common on land. These have all turned out to be excess volatiles which means there are a lot of them and they are light weight. Theyve come from outgassing of the earths core as it cooled. Since the outgassing produced these materials as well as the water, the running off of which caused most of the erosion which was the source for the rest the salts, both the water and the salt ended up as ocean at about the same time and ocean salinity has always been about what it is now. Ocean salinity is the grams of dissolved material per kilogram of seawater, or parts per thousand. The average ocean salinity is 35ppt or 3.5%. No matter where you measure these things in the ocean, the proportions are about the same. This is because the ocean has had so long to mix. The longer you mix a cake batter, the more uniform it becomes, right? Same idea. Salt can only be removed by sedimentation (mostly), so its water movement (evaporation/precipitation) that changes salinity. Density is defined as mass per unit volume—note that this is similar to weight, but not quite the same thing. One cubic centimeter of water has a mass of 1 gram, so the density of water is about 1 gram per cubic centimeter. Your density is about 1. A typical rock has a density of about 3. Adding salt to water increases its density. Likewise, putting water under pressure increases its density (although not by much compared to other things). Cooling water off also increases its density, BUT once it freezes, it becomes less dense. (You know why that is, right?---if not you better review ice structure!). You can decrease density by heating water. Therefore, fresher, warmer water will essentially float on saltier, colder water. Water on the earth came from outgassing as the early earth cooled. Because earth is just the right distance from the sun, the water did not evaporate and it did not freeze. Instead it became mostly ocean and has been around ever since. We arent getting any more, and it isnt leaving us. But it does move. This movement is called the hydrologic cycle. 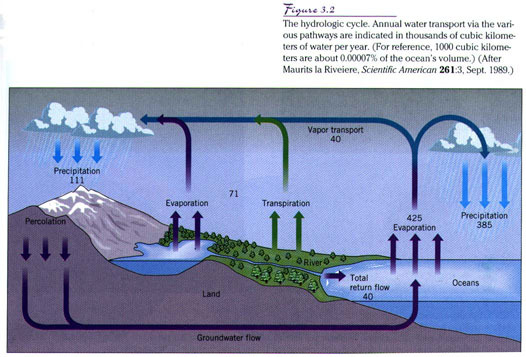 The hydrologic cycle includes everywhere water is found on earth. This includes the oceans, ice, groundwater, rivers and lakes, and the atmosphere. Note in the table the % of water found in each of these reservoirs at any given time. Also note the figure which shows how much water moves annually. Only about 0.4% of water on earth is not salty! And most of that is frozen. Ocean covers about 71% of the earth, but the layer of ocean/atmosphere relative to the size of the earth is equivalent to a layer of paint on a bowling ball! The biggest ocean is the Pacific. It is deeper and almost twice the size of the Atlantic. The Atlantic is the shallowest, and the Indian is the smallest. Average ocean depth is 4000m (about 12,000 ft or 2.4 miles).